Valve responds to EA's accusation that Steam's heavy discounts "cheapen" intellectual property. While consumers adore Steam's discounts, EA seems less fond. The publisher's Senior Vice President of Global Ecommerece, David DeMartini, recently claimed Valve's habit of offering games at a discount "cheapens [their] intellectual property." Valve disagrees. "If that's what we thought was happening, or that's what we saw happening, we wouldn't do it," Valve's director of business management, Jason Holtman, told PCGamer. "Actually, all the data is contrary to that. A promotion is not a policy; a promotion is just a feature to give people more value." "It's not as if a 75% offer or a 50% off sale at some point in timeÂ cannibalizesÂ a sale that would have happened earlier, it's just not true," he continued. "We're actually seeing both of them growing. We don't see oneÂ cannibalizingÂ the other. If we did, we wouldn't do it." According to Holtman, not only do temporary sales have no negative effects on sales, even giving away games for free doesn't seem to stop gamers from buying them when they're full price. 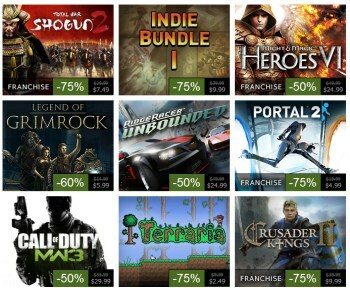 "We put Left 4 Dead 2 and Portal 2 on sale. If we thought that was killing our franchise, or hurting the value of games, or hurting the revenue we could generate as a company, we wouldn't do it," he said. "We've even gone so far as to give away Portal for free a couple of times. Whole days where it's not free for a day, it's just free. We looked at this amazing data afterwards. The day after the sales were exactly the same, if not more."